Download:What should you expect from a PAM PSM solution? WHITE PAPER: WHAT SHOULD YOU EXPECT FROM A PAM SOLUTION? Traditionally, privileged access to systems has been a right of those who need to maintain or support IT infrastructure. But today, privileged accounts remain a weakness from both insider threats, as well as a target for external attackers with increasing frequency and complexity. 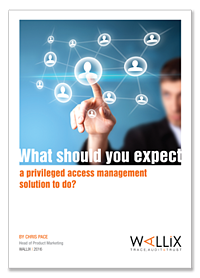 This free eBook helps you effectively manage and secure privileged users interacting with your organization.